The simple name;Woomera, generally refers to an iconic Australian 'town' located in South Australia's 'North West Pastoral Region', approximately 500km north of Adelaide, the capital of the State of South Australia. In reality, 'Woomera' also refers to the wider 'Woomera Range Complex' (WRC), a huge Defence systems testing range covering an area of approximately 122,000sqkm (roughly an area the size of England). Woomera is well known for the establishment of the Woomera Rocket Range created in the outback area of South Australia. It is situated just off the Stuart Highway about 180 kilometres north of Port Augusta. We stayed at the Woomera Traveller’s Village and Caravan Park which is fairly old and tired but we received a warm welcome and the amenities are clean. One of the features of this park was the Cudgee Bar which has been created in an old shipping crate (fully air-conditioned) and only open for a few hours each evening. A great place to meet locals and enjoy a reasonably priced drink. ELDO which stands for European Launcher Development Organisation was built as the mess area when this project began. This is now a well known place to meet for a drink and they have accommodation available for visitors, great meals and a lovely lounge areas. 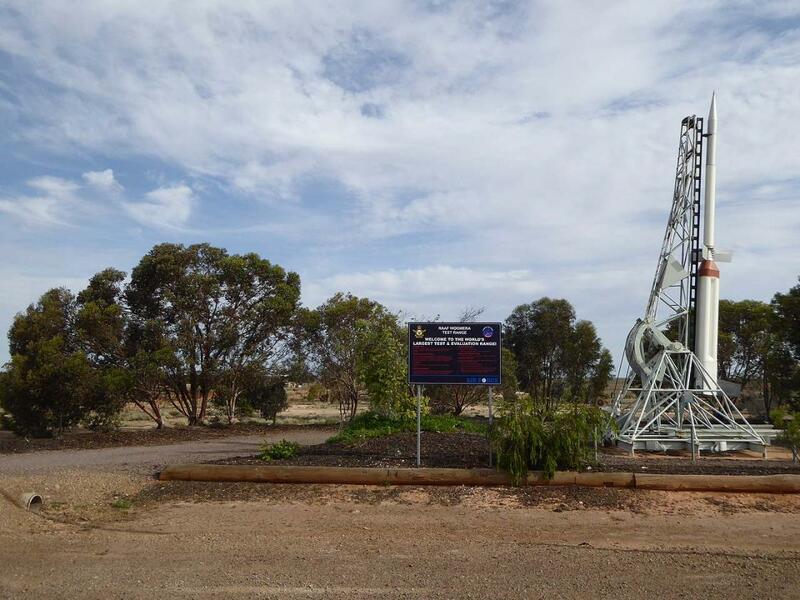 The Visitor Information Centre also houses a Museum which goes through the establishment of Woomera as a very important base for rocket testing and it's history is explained. They also display memorabilia from Len Beadell who is credited with surveying the area for this important rocket range and other government projects. We listened to audio books on his adventures while travelling towards Woomera which are very interesting. There is also an outdoor rocket and plane display just along the street from the Visitor Information Centre. Woomera now only has a few permanent residents but is still used for testing. have you been to Woomera? Explore Woomera with RvTrips and find out where to stay, what to do and what to see. Helping caravan, motorhome and camper owners have a great holiday.